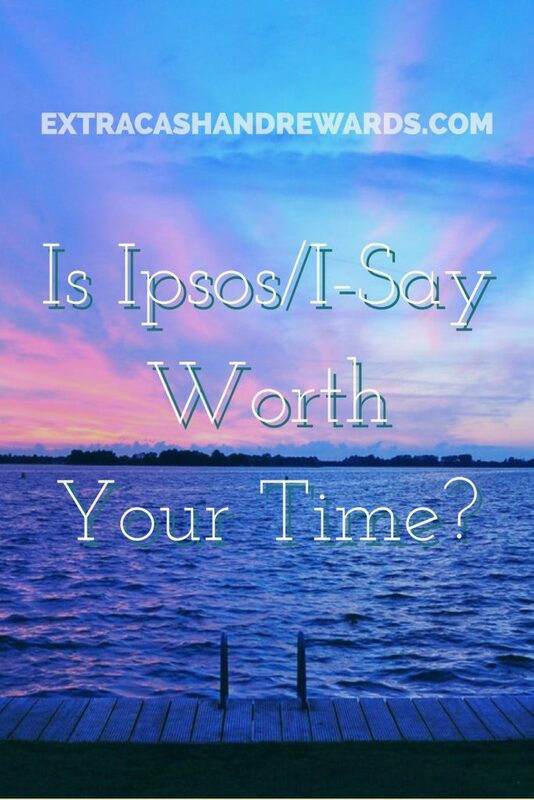 Ipsos (also known as the I-Say Survey Panel) is a survey site that has been around for a very long time. I did a little digging for you to find out what I could on how this one works. You may just decide it's a good panel to add to your list if you're participating in more than one (and you should be if you want regular payments from surveys coming in). Or … you may decide it's not worth the trouble. First, let's get the basics out of the way so you'll know what you'd be getting into before you decide. You sign up for the Ipsos panel in much the same way as you would for any other survey panel. Just fill out some general information about yourself and answer basic questions about your household. After you've done this, you'll receive an email with a link for you to confirm your membership with the Ipsos survey panel. Shortly after that, you should start getting invitations to participate in surveys via your email. For every survey you complete, you get paid in points that you can redeem for rewards. If you get a survey invitation and find out you don't qualify to complete it, you do at least get 5 points for your time answering the screener questions. This is great because a lot of panels won't do that for you. Ipsos does occasionally do product testing, which means you might get to test out — and keep — a product that hasn't hit stores yet. You may or may not get invited to do it. Some members have said they can't ever seem to get in on these. It will just depend on how many products they have available to test and the demographic they need for the test. There are also sweepstakes going on with the Ipsos panel all the time, and sometimes the surveys you take will only reward you in entries for the sweepstakes. Which, in my opinion, is a bummer. But on the flip side, you will usually be entered into their sweepstakes just for being signed up with them. So sometimes you could win even without doing anything other than being signed up as a panelist. The sweepstakes are legit, they do really award the prizes. Some people have said they won on various forums. What Rewards Does the Ipsos Panel Give You? Like most other survey panels, you can redeem for virtual gift cards to popular retailers, Paypal cash, Visa debit cards, and more. You only need 500 points in your account to start redeeming. If you request Paypal cash, it will take a few weeks for them to send it to you. However, virtual gift cards show up in your email as soon as you hit that “redeem” button. So this is an “instant pay” panel, provided you are not requesting Paypal cash. Is Ipsos Survey Panel a Scam? No. They don't ask for money from you nor do they try to rip you off in any other way. This is actually one of the more reputable survey panels out there. Many people say that their points add up quickly, and they are regularly redeeming them as well as getting opportunities to test products. Ipsos Survey Reviews – What Do People Say? The best place to check for reviews of various survey panels is Survey Police. And despite all the good things about Ipsos — the low cash out, the variety of rewards, the points awarded whether you screen out or not — there are some complaints, and the panel has an overall 2 star rating there. People complain about not getting rewards, tech issues, and the non-responsiveness of customer support when you need help. That said, I do see people singing the praises as well — getting paid, lots of surveys, etc. Should You Try It? My Opinion. I think the Ipsos survey panel is legit. My research has determined that, despite the complaints, it definitely is. Even if there are some people claiming they didn't get paid, they are clearly paying others. I don't know if the non-payment is intentional or just the result of disorganization. My guess is the latter. I would recommend trying it if surveys are your thing, but I would not advise depending on it entirely as the sole survey panel you use. After joining Ipsos, you may want to also sign up with some of these other reputable survey panels here just so you always have surveys waiting for you in your inbox (more surveys = more money!). Go here to sign up for Ipsos Surveys. Come back and let me know what you think after you've been at it for a while! I’ve been using I-say for roughly a year. I like them because they don’t ask for much from you, and they pay via PayPal. I don’t really get complaints about how points are collected. I’ve used Toluna for roughly the same amount of time, and still haven’t reached the 60,000 points needed to get something like $20 in return. Now they have this thing where you can spend points on the chance to win items too. Huge waste of time. In contrast, it’s 1500 points to cash out $15.00 on I-say: low paying surveys are 45 points, mid pay is 60-90 points, and high paying (like alcohol consumption surveys) total 300 points. I collect $15 from I-say every 2-2.5 months, especially when in-depth shopping surveys or alcohol consumotion surveys come up. You get entries into the draws, and get extra chances to win money/items through the Poll Predictor game at the end of every survey. If you fail to qualify for a survey, you always get another draw entry, and usually 5 points, as well. Based on my experiene with I-say, I definitely recommend it as a cash booster. give no reason for doing so, I’ve read from other users that I’m not the only one who has experienced this problem with this survey company. Beware. Spend a lot of time, accumulate a lot of points, but you won’t be able to redeem the points. The points suddenly disappear! I used to like the site, but they recently redesigned it. Since the redesign it has been terrible. Rarely are the points applied to my account after taking surveys. I’m repeatedly having to contact them to get the pts applied. Surveys are often now longer for fewer pts even when they are applied. It has become a major hassle. I will be canceling my account once I receive the 1000pts needed for one final reward, just don’t want the points I’ve already earned to go to waste.